INES – The international nuclear and radiological event scale The INES Scale is a worldwide tool for communicating to the public in a consistent way the safety significance of nuclear and radiological events. Just like information on earthquakes or temperature would be difficult to understand without the Richter or Celsius scales, the INES Scale explains the significance of events from a range of activities, including industrial and medical use of radiation sources, operations at nuclear facilities and transport of radioactive material. 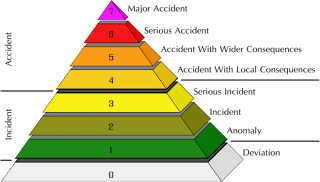 Events are classified on the scale at seven levels: Levels 1–3 are called “incidents” and Levels 4–7 “accidents”. The scale is designed so that the severity of an event is about ten times greater for each increase in level on the scale. Events without safety significance are called “deviations” and are classified Below Scale / Level 0. Nuclear and radiological events are promptly communicated by the INES Member States, otherwise a confused understanding of the event may occur from media or from public speculation. In some situations, where not all the details of the event are known early on, a provisional rating may be issued. Later, a final rating is determined and any differences explained. To facilitate international communications for events attracting wider interest, the IAEA maintains a web-based communications network that allows details of the event to immediately be made publicly available. The two tables that follow show selected examples of historic events rated using the INES scale, ranging from a Level 1 anomaly to a Level 7 major accident; a much wider range of examples showing the rating methodology is provided in the INES Manual. INES applies to any event associated with the transport, storage and use of radioactive material and radiation sources, whether or not the event occurs at a facility. It covers a wide spectrum of practices, including industrial use such as radiography, use of radiation sources in hospitals, activity at nuclear facilities, and transport of radioactive material. It also includes the loss or theft of radioactive sources or packages and the discovery of orphan sources, such as sources inadvertently transferred into the scrap metal trade. When a device is used for medical purposes (e.g., radiodiagnosis or radiotherapy), INES is used for the rating of events resulting in actual exposure of workers and the public, or involving degradation of the device or deficiencies in the safety provisions. Currently, the scale does not cover the actual or potential consequences for patients exposed as part of a medical procedure. The scale is only intended for use in civil (non-military) applications and only relates to the safety aspects of an event. INES is not intended for use in rating security-related events or malicious acts to deliberately expose people to radiation. It is not appropriate to use INES to compare safety performance between facilities, organizations or countries. The statistically small numbers of events at Level 2 and above and the differences between countries for reporting more minor events to the public make it inappropriate to draw international comparisons. Very interesting post. Thanks for sharing it! It is always a joy to learn something that I didn't know. I have you to thank for teaching me something new.